SOLD $176,000 Online Estate Auction! 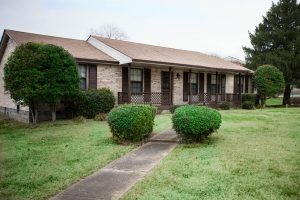 3 BR, 1.5 BA, All Brick Home | Middle Tennessee Real Estate :: Maples Realty & Auction Co. Very clean, move in ready home or investment property, 3 bedrooms, 1.5 baths, all brick home. Features a covered patio, fenced in yard, carport, hardwood floors, and concrete driveway. Conveniently located to I-24, Downtown Nashville, shopping and dining. Directions: Take I-24 Exit 59 onto Bell Rd., to right on Blue Hole Rd. to left on Tusculum Rd., property on right, on the corner of Benzing.